A year and a half ago, I wrote about meeting Samantha DeZonia of Wilderness Tactical Products at the United States Concealed Carry Association’s Concealed Carry Expo in Atlanta. I knew of Wilderness Tactical for their Safepacker, which I first heard recommended by Michael Bane. A close encounter with a black brown bear just before the CCX reminded me that I had wanted a Safepacker for a long time. Sam was good enough to send me a left-handed model to fit my Beretta Nano. My Safepacker came with the optional shoulder strap and even though off-body carry is verboten for many, I most commonly use it that way. But this past summer I got to put the Safepacker — and a Wilderness Tactical Original Instructors Belt I purchased at the Gunsite Academy Pro Shop — through their paces. My wife and I visited 6 National Parks — 5 in southern Utah plus the Grand Canyon — in 7 days, hiking over 50 miles. 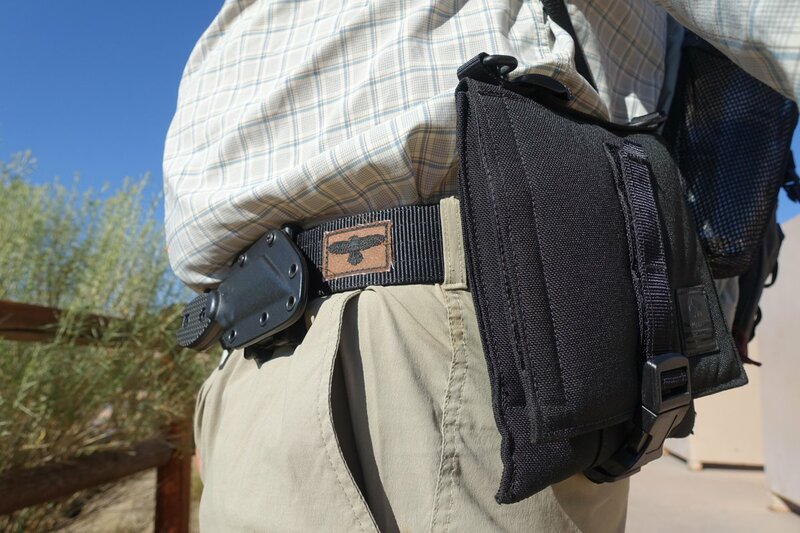 I wore the Safepacker and Instructors Belt every day, comfortably and without drawing any unwanted attention. I thought I had posted about this experience already, but a recent visit to the Wilderness Tactical headquarters in Phoenix made me realize I hadn’t yet. I learned much more about the company and their products during that visit and will have more to say about that soon. Tags: holsters. Bookmark the permalink. Previous post ← Jiu-Jitsu is the Answer. What was the Question? Beretta Nano vs. BROWN BEAR?? I’d put my money on the bear. Actually, I think you mean black bear. Browns are out West and in Alaska. I’d still put my money on the bear. That said, there is this article. Shows how much I know about wildlife. Unfortunately need a single sidearm to deal with all possible threats. Khal, you beat me to it. I also had the immediate thought that a nano for brown bear, in fact any bear, isn’t enough gun. I’m no bear expert, but I think I’d want a minimum of .44 mag for them, and .454 Casull would be preferable. Less than those is kinda like using. .22 LR for self defense – many people have certainly been killed with that cartridge, but it’s far from an ideal choice. David, there probably isn’t such a single sidearm unless you like carrying a short barreled .44 mag around for your EDC in Winston-Salem. 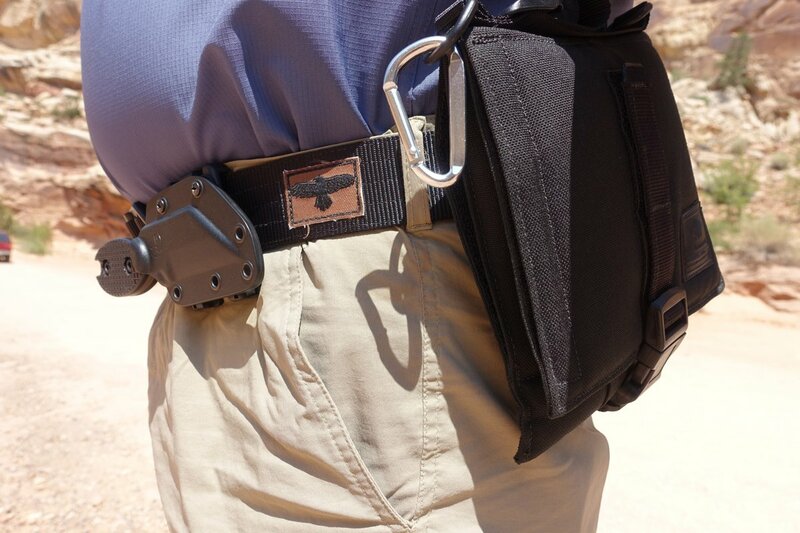 The corollary is that there isn’t a single holster suitable for all occasions either. one does not go ANYWHERE in bear country without being armed with a firearm suitable for bears. Especially in Alaska. That includes going to the outhouse! For those interested, a couple studies on bear spray and guns in Alaska I sorta referenced. Stephen Herrero is one of the premier guys in the field. His book “Bear Attacks; Their Causes and Avoidance” is a great resource. The latter has a free download I think. I know I found one somewhere. As an Alaskan who has never had to shoot a bear, but knows people who have, the recommendation I have accepted is a hard cast, usually heavy for caliber, bullet moving as fast as the gun and shooter can handle. The point of a larger caliber then is to amplify those characteristics. Black bears, like the cats, are thin-skinned and light-boned compared to brownies, but the key is still a bullet hard enough with enough momentum to penetrate deep enough through muscle, fat, and bone to reach the vitals from any angle (or punch a hole in the skull or break a shoulder given a charging bear’s available targets). If your threat is mostly black bears and cats, the gun you use and carry daily is usually going to be the best “woods gun” for you, because you are going to need to make fast and accurate shots at close range under pressure. The same rules apply as with people-defense in that regard, a “security blanket” boomer you don’t practice drawing and firing under time pressure, and that is inconvenient to be carried all the time, is not going to be to hand when you need it. So for a handgun, I recommend people carry the best caliber/bullet available in the same basic package as their carry gun to take advantage of all that commonality of training and gear. For me, given I do have to worry about big bears and moose, that is a 1911 in .460 Rowland using hard cast 255 gr Buffalo Bore rounds when I am in “the woods.” I use the same rounds in my bored-out 625 when I have a revolver itch. In town we have hundreds of local black bears and dozens of brownies in the salmon stream greenbelts, not to mention the Bullwinkles, so I carry a magazine of the same bullet in a .45+P in my LW Commander. If I go off the pavement I will tend to switch out my “people magazine” for it. If I were a Glock or other plastic gun guy, I’d use the Rowland or the hard cast 10mm depending on what I usually carried. I’d do the same with a .40 if I had one. For revolvers, the same 180gr loads in .357 Mag will likely deal with anything in the Lower 48 quite handily, and they have them in .38+P as well I think. That said, if you want to stick with 9mm it would be worth looking into a full(er)-size gun for capacity and “shootability”, even in 9mm you can load the Buffalo Bore 9mm+P 147gr and likely be just fine for cats, black bear, and whatever canines you come across. Carb – Great info and good advice. Reality is that I may be undergunned for both bears and humans, but I will never carry a full size duty gun in everyday life. If I get more adventurous in my hiking and outdoor pursuits, I might get a larger gun to take with me. But for now, I will just hope that my primary strategies of awareness and avoidance will keep me safe, and failing that, that a few well placed rounds will be enough. Also, bear spray is another dual purpose (people and critters) defensive item that gives more options for cases where shooting might not be definitely called for. * Same rules apply, have it to (or in) hand and practice with it. Don’t have it in a pack pocket or out of reach. I tend to keep mine in a pouch on my actual belt so it stays with me whether I have the ruck or fanny pack on or off. Given your gun constraints it should definitely be on both you and your wife’s gear list anywhere there’s even a chance of an encounter. You don’t need the big cans, they make more pocket-sized models that you hardly notice having on. And now having read the blog, I feel better. And more cautious. I almost bought a 10 mm semiauto from my neighbor. May have been a Browning but it was several years ago and I forget. Then my neighbor decided to keep it. When I go out of my house I have my Beretta 92FS loaded with Hornady 115gr JHP. That should go for anything I encounter. My wife swears by her 92, like what she carried in the USCG back in the day.